Beloved is my fair, memories of all family together at the demolition derby, tradition since i was in my mothers womb only last yr first time i missed..im 47. Rabbit club sewing club even on dunking seat one yr..wrestled a pig ..even passed out political tracts and watched the ProLife booth.. fair food booths rides ive loved it all…The last place i spent with my grandmother here on earth cancer she died few days after… my wonderful belove Randolph Fair… Theres also so secrets ill never tell!! Thank you to the person who wrote it! I grew up as a fair kids and my kids are fair kids. Best thing for all of us! I would love to print this and pass it out at our local quality assurance session for our fair. May I have your permission? Please provide your full name so that I may give you proper credit. Thanks. We moved and changed our lives to accommodate 4H and FFA and raising animals for our kids. We all agree it was a choice that was absolutely pivotal for our family . Thanks for this! I am a mom of a 13 year old daughter and we are moving to Arizona in June. My daughter has lived her entire life in California and is very apprehensive about moving. I am going to be married to an amazing man and he and I plan on getting her involved in 4-H. She owns a horse and loves animals. Thank you for your post. It is inspiring. I was in 4-H and took nonanimal projects to the fair, so I didn’t really have some of these fair kid moments growing up. However, I know I am a Fair Kid’s Mom though because I married a dairy farmer and our family has experienced every one of these points showing dairy cattle! Thank you! In Indiana, there are almost endless games of Euchre in the barns. Fond memories for a fair kid. Thank you! This post is very true. I was raised up as a Fair Child, in 4-H from the time I was old enough to join from a cloverbud, then my last year when I graduated. I was always up by five am, my rabbits came first, gyros and snow cones came second, then an entire day of babysitting and watching,my animals like a hawk with minimal self care came along as well. 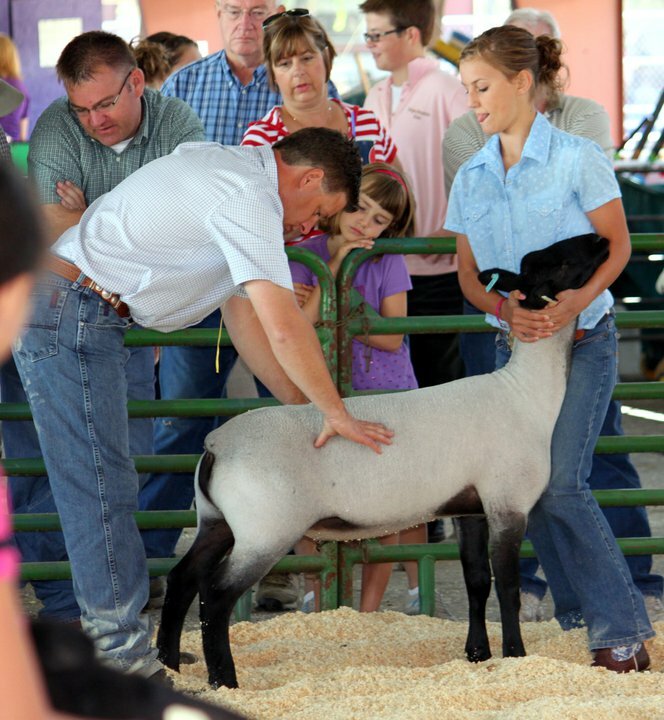 Oh, how I miss the fair. . .my future children will surely be in 4-H, the greatest of lessons are learned there. As look back over the years when your kids did all of the things that were listed and then add all of your grandchildren who have done or are still doing them you realize how much they have learned from their experiences and how all of this has impacted their lives. Fair kids are a special group of young people who love their animals, meet super people, and grow up in a special way. Careers, lifelong friends, and a different way of looking at things are nurtured in this atmosphere. May it long continue! I am a former fair parent (beef cattle)4-H& FFA ,graduated to a fair grandparent (hogs) 4-H so far but with a son and daughter-in-law that are ag-ed teachers and a daughter that is a clover bud adviser.. My husband & I are strong supporters of the junior fair . I encourage everyone to go out and bid on an animal at the sale. Thank you so much for these words of truth! The fair is our life and has been since I was a kid. (I even got engaged in the goat barn the morning of the show, and delivered our first child 3 years later the day after the fair.) Our children have literally grown up in the barn and look foreward to our fair every year. Also as a 4-H leader for 15 years, I have helped many children to have the same fair experience our children have each year too. Being a 4-H kid was one of the highlights of my youth. It was so exciting getting ready for the Fair. I wish I lived in an area that had an active AG Fair. I know my kids would love it. Thanks for the happy memories! 4-H Educator in the neighboring county. Our grand kids are in Cloverbuds and are showing at the National Livestock Expo and Ohio State Fair. 4-H, fairs , and camps will live on forever in our family. Thank you for sharing your passage with us. It was wonderful. I would also like to print it off with your permission. Absolutely! I just ask for my name to remain on the post 🙂 Thank you! That smell is the smell of money at the end of a long year. Your in 4-H with kids, you come out young adults, and forever freinds. met others kids and you find out that those are your old 4-H pals kids. and ask “grandpa can we go pig shopping”. I loved this. I’m 23 and couldn’t ever leave, I’m the Peter Pan of county fair. 4-H leader, intern in the 4-H office, and the ladies in the fair office know my name, face, and family tree. I love it and wouldn’t have it any other way. how true. went through all the steps myself over 50 yrs ago, followed by 3 children and a grandson. Got back into active 4H leadershp with grandson. retired 2 yrs ago. Grandson is now in Ag classes. How true! I am entering my first year as a non-4-Her (I aged out), but I am helping my siblings at the fair this year for sure! 11 years of showing animals at the fair was truly one of the best things that has happened to me. I did cry when I sold my first animal, and I did cry after my last show. I ate my meals only after my animals were fed and clean (and after helping my siblings with their animals), I learned a heck of a lot about keeping cool when I wanted to explode, I have muscles, and I am NOT afraid of poop. Also, one thing not mentioned, is how much you learn about teamwork. That might be the hardest and best thing I ever learned. So so so true! Fair was a way of life! I thought this was going to be about fair-skinned types. Then I thought it would be about kids with a strong sense of justice. I guess I was not the target audience. I grew up doing 4-H and raising animals. I would never give this experience up for anything. I learned so many valuable lessons at the fair. I am thankful for the many great leaders in my life who made it all possible. I wish I was still able to participate, but I am too old. It isn’t completely over yet though. Now I have the opportunity to be the leader and make an impact in someone else’s life. I can so relate to this and all of these are/were me. I sure miss those days. 4-H. It is my hope to get her started as soon as we get to Arizona. She owns a horse and would really like to begin with cattle. Not sure exactly how this works but I am determined to find out and get the ball rolling. Thanks for this amazing post…..
Heck ya that is all true for me and I have been in 4-H for only two years!!!! Followed Marianne’s recommendation to come over here. Thank you Marianne. And Tony . .. you’re living a beautiful life as revealed in your words. I was never a 4-H kid but I became a 4-H adult. I got my girls involved and in so doing got myself involved. I was a leader for 21 years in the horse and pony project, it was so rewarding watching the kids become confidant young teens and then competent adults. I got out after my girls aged out but guess what, my grandson is now old enough to be a clover sprout and I don’t want him to miss out so I’m back in as a leader. I recommend it for every child no matter what their interest. I think I have learned as much as the kids. Love it and want to share. I really enjoyed this piece of life so dear to my heart. My husband and I were both club members, our 5 kids were all members. We became leaders and were for years. Every kid in the club was our kid especially at fair time. Didn’t mention 60-70 kids in the club we first began in. After our kids were out we moved and the hardest thing for me was leaving those kids, every year was a renewal and a good-by. It was never a job or regret, to watch them succeed was worth every minute. Those times were the very best part of my life. I had a teacher once tell me she could always tell a 4- H kid in her classroom. To bad the extension offices have made adjustment. We had kids in home ec, small animals, poultry , etc. but mostly beef and hogs, diversity made them involve themselves all the time. The rewards in giving of your time brings many-fold rewards and memories. Thanks to you for reminding me today the wonderful kids I’ve had in my life through 4-H. I love number four… its such a real aspect of life and beautifully put! Wonderful list! I was a Fair Kid back in the days when Connecticut was more rural. This post sure does take me back to some wonderful times and memories! I got to raise my kids doing Fair!! Lots of good good memories. Lucky that I could do that for them. My daughter sent this to me. She graduated high school last year and has been in 4H and FFA as long as I can remember. My 2 boys did it before her, and she said that this sums up everything perfectly! I was a fair kid and now a fair adult. I am on the horse team that runs the horse show at our fair. I am also 4-H leader going on 15 yes now. One important aspect for leaders and parents is to make sure we leave them with good memories. If you make it a good experience and not let the competition aspect override common sense they will remember it as a happy time forever. It is an amazing feeling to get that hug and thank you when you see a former member. A good example is a while back I was traveling through a town about 120 miles from my town. When I saw the sign it brought back memories of my last two state fairs hanging out with girls from there. Had a smile the rest of the day. I was a town kid, we didn’t even have a dog. My husband, on the other hand, has been involved in the agricultural community since day one. His grandparents owned the local livestock auction and his mom ran the office. He was kept in the office drawer! Of course, this was all 1oo years ago. bless our 4-H and FFA clubs. I cheated and was in 4-H for thirteen years. met my wife there. Our kids were in as long as they were allowed. Thanks to 4-H ,we were fortunate to have a heifer that took our family to Illinois, Iowa, Tennessee and of course our own Indiana state fairs. This same heifer also took the family to Denver, a real experience, reserve champion Simmental in the junior show. None of this would have happen without 4-H. Now grandkids are in and who knows what will happen. Thanks for a chance to BRAG! You know you are a fair kid when the week before turn in is more stressful than finals week at school. I am 69 years old, so my showing days were a long time ago. But my heart still warms when I see folks showing livestock. I cherish my memories of my siblings and I during our many, many years of showing in numerous shows. Thanks for triggering those precious memories! As a fair kid this hits home 100% as number 20 is very true this year. my last show will be here in a few days and I’m already getting sad. All these really show what its like to be a fair kid. some people just don’t understand, but now they will.